A trusted source working at a Samsung retail location in the US has sent us the image below from an official company correspondence. 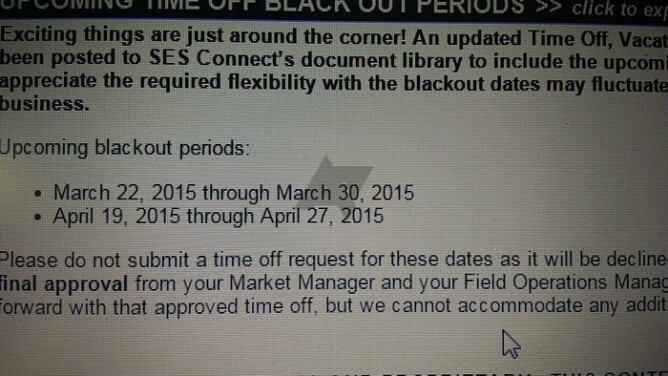 In it, you will see Samsung blacking out employee vacations, leaves of absence, and time offs, for two upcoming periods. The first starts on March 22nd and lasts until March 30th. The second goes from April 19th through April 27th. These blackout periods are usually an accurate indicator of when the company expects a big product launch and wants all hands on deck. The timing, a few weeks after Samsung's March 1st Unpacked MWC event and in the same ballpark as previous Galaxy S phone launches, speaks for itself. However, the presence of two distinct blackouts is new and interesting. It most likely corroborates the rumors that the S6 will come in two flavors — a regular one and a curved Note 4 Edge-like one. If so, it's probable that the Galaxy S6 will launch first in March, followed by the S6 Edge in April. Compared to the Galaxy S5, which was only released on April 11 last year, Samsung seems to be going for a shorter announcement-launch wait — a strategy any drooling smartphone enthusiast wholeheartedly approves of.